I bought this plant for $1.50 at my local nursery. It did not come with a tag. 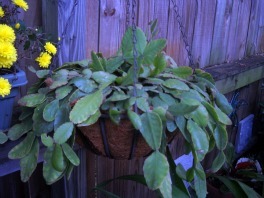 I have Christmas cactus and this plant looks similar. Hi Lisa - great score! This is indeed similar in appearance and cultivation to Christmas Cactus, the Schlumbergera; there are many such epiphytes which originate in jungle situations. The one you have acquired seems to be a Rhipsalis, which are very similar although they have thinner 'leaves' which are actually flattened stems which perform the same function as leaves on other plants. They also lack the little horns on the leaves of Christmas cactus, just for a quick way to ID them. Expect it to bloom with spectacular flowers in the late fall, once light levels start to change which triggers bud set. Follow the same general guidelines for care on the Schlumbergera page, and I'm sure that this relative to the Epiphyllum will amaze and delight you with its fantastic and extravagant blooms. This is definetly an easter cactus.